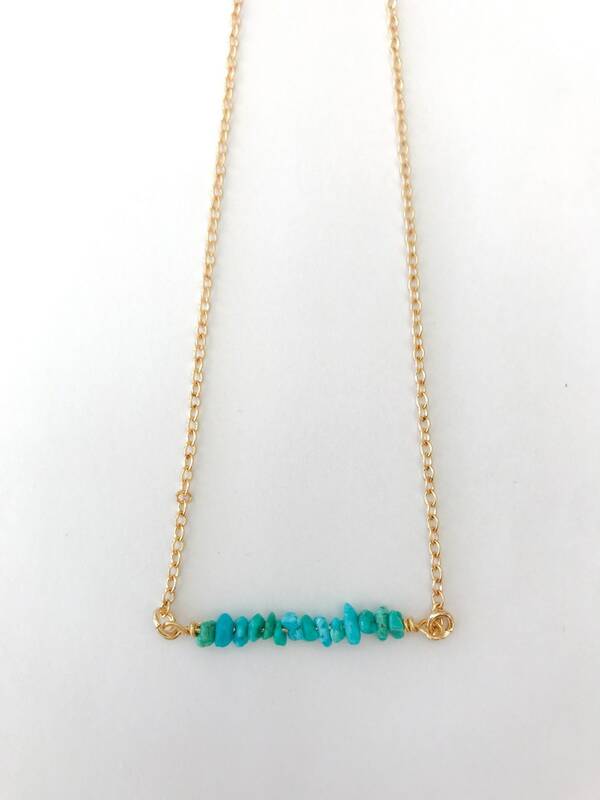 Welcome to Magpie Studio + co.
Chain Length Gold Filled 17" Gold Filled 19"
This turquoise chip bar necklace is the perfect accent for any outfit. The necklace features tiny 2.5 mm chips on a gold filled 1″ bar. 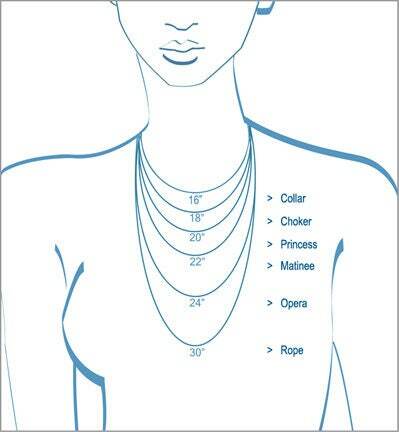 This is an everyday necklace that can be worn alone or layered with other necklaces. ►Model is wearing a 17" necklace. Each item is handcrafted and made to order. Please see Policies Page for current production time. If you need an item rushed, please contact us. Each order is packaged in a gift box with a complimentary polishing square to keep your jewelry tarnish free and shiny. We take pride in our packaging and know how important first impressions are when giving a gift. Stay connected and up to date on new products, sales, giveaways and holiday production times. Monthly Giveaways hosted on Instagram, make sure to follow along! 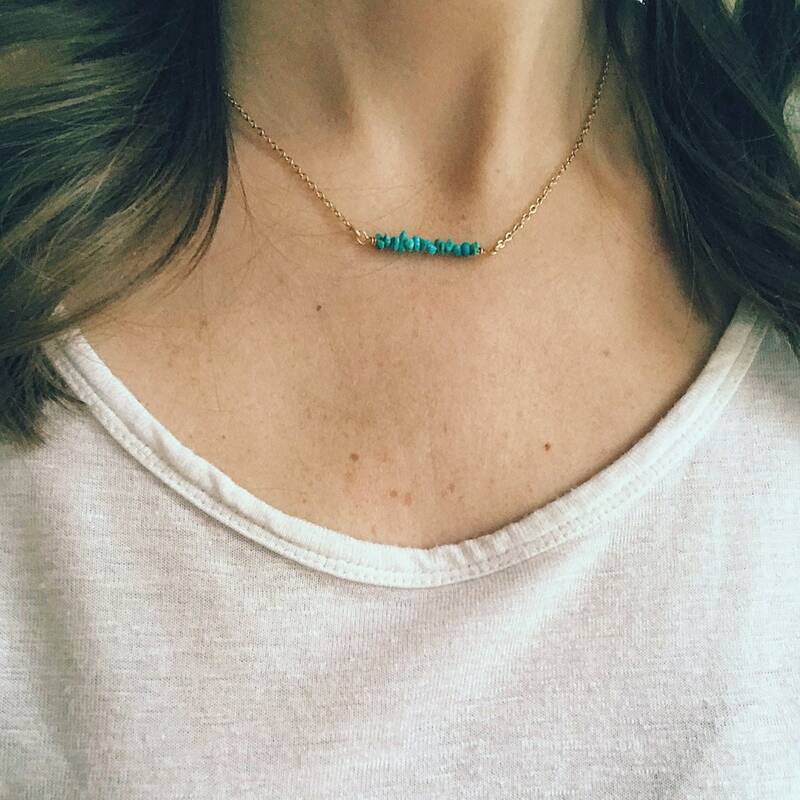 We love to see your photos of you wearing your Magpie Studio + co. jewelry! Share a photo with us for 10% off your NEXT order. Use @magpiestudioco and #magpiestudioco to receive discount. With your purchase, you are supporting handmade and for that we appreciate your dedication to the arts! 3-5 business days, plus transit time. -------->Peak Holiday's such as Christmas, Valentine's Day, Mother's/Father's day will have an extended production time of 7-14 days, plus transit time. Please see Magpie Studio + Co. home page for up to date Holiday deadline. You will receive an email confirmation after you place your order. We will contact you if there are any questions or concerns about your order. You will be notified when your item ships. We ship all items in a secure bubble wrap envelope to keep your jewelry safe during delivery. All domestic packages will be sent with a delivery confirmation number. Shipping upgrades available. If you would like to purchase insurance for your package, please let us know. Magpie Studio + co. is not responsible for lost items. Typically it takes 1-2 weeks to ship overseas. Unfortunately we cannot track orders out of the US. Please allow enough time to receive your jewelry. Customs can prolong your package delivery 2-3 weeks, sometimes up to 8 weeks. We cannot be held responsible for lost or delayed packages. Custom and tax fees are of responsibility of the buyer. We will gladly return or exchange any item within 7 days of delivery. Our goal is to make you fall in LOVE your Magpie Studio + Co. jewelry. If you are not 100% satisfied, please send us a message so we can discuss a solution. Please do this before leaving feedback, we would greatly appreciate a chance to resolve the issue. NOTE: We do not accept returns or exchanges on personalized items because of the custom nature of the piece. and has many of the same quality properties as solid Gold. GV is genuine .925 sterling silver that has been expertly plated with a thick layer of 14k-24k gold. Gold Vermeil is the perfect option for those with metal allergies due to the durable thickness of the gold combined with the base of sterling silver. GV jewelry is one of the hottest trends right now as it strikes the perfect balance between quality and value. Sterling silver is an alloy that is almost fully comprised of pure silver. The exact amount of silver content is 92.5%. The remaining 7.5% is almost always copper. This mixture increases the durability of a piece while not affecting the natural silver visage buyers are looking for. Typically 1-2 weeks or in rare cases it can take up to 60 days for your package to arrive. Certain countries charge customs fee or taxes so please be aware of these fees before purchasing. Custom and tax fee are of responsibility of the buyer. Once item is shipped overseas, Magpie Studio + Co. has no way of tracking the item so it is out of our control after that. Feedback is very important to me. Don't forget to leave feedback after you receive your jewelry. If you are not happy with your purchase, please send me a message so we can come up with a solution. I appreciate a discussion about the problem before you leave negative feedback. "Thank you for doing what you do and playing such a special part in Erika’s birthday today. 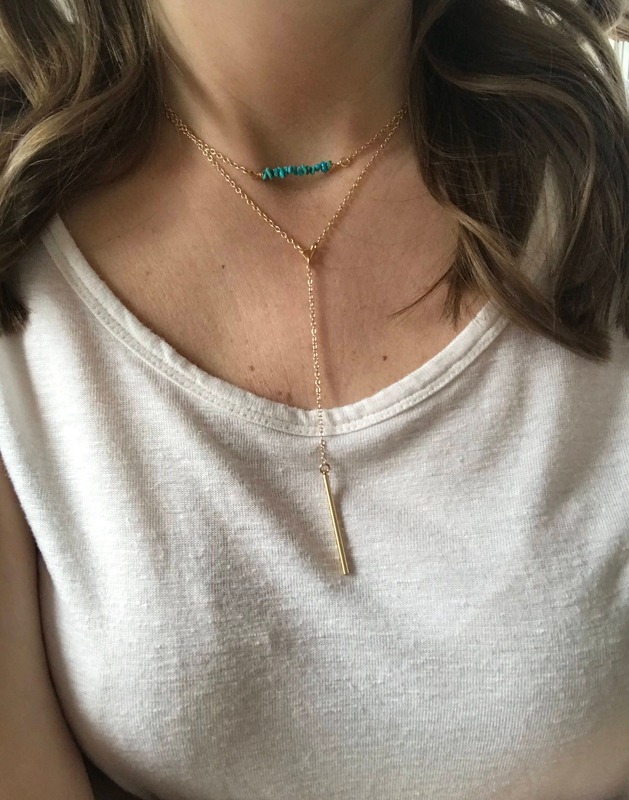 She is going to treasure this necklace FOREVER…it is more than just a necklace to her, it is a reflection of what she is most proud of in her life, being a loving mother of three beautiful kids. I don’t think she is ever going to take it off!" "I opened up the package and took the necklace out of the pouch and was teary eyed. It was exactly what I had been looking for and was so excited to put it on. I LOVE IT!! It is more beautiful in person. I put the necklace on and anyone I saw for the next two weeks showed them and gave them your site. The ordering process was simple and easy and the finish product was just what I ordered and then some!" "The best gift I've even given."